Says Donald Trump’s "Make America Great Again" hats were made in China. By Katie Sanders on Wednesday, October 7th, 2015 at 6:40 p.m.
Donald Trump’s presidential campaign was forced to address a widespread allegation of hypocrisy this week, and it had nothing to do with his former liberal ways or his company’s overseas investments. Much worse. Social media posts claimed his unmistakable, sometimes ironically worn "Make America Great Again" hats are not made in the USA. "The image you shared is not an official campaign product," Trump spokeswoman Hope Hicks told PunditFact in an email. "All product for sale on DonaldJTrump.com is made in the USA." Kennedy’s company, which his family has owned since 1977, has been making this style since the 1970s. Trump has been wearing it and selling it on his golf courses for years, but it’s been big with the hipster market since the summer (well, so has the "dad hat," he said). "It’s just the same old story that what goes around comes around," Kennedy told us by phone from inside his factory, machines whirring in the background. "But there’s news every day on the hat," he added. From there, the hats are distributed by Ace Specialties LLC, a Lafayette, La., company that normally deals with gear for the oil and gas industry. Ace Specialties president and owner Christl Mahfouz said she had seen a similar meme on Facebook, "and that’s not even his hat." "Definitely everything on our side is made in the USA," said Mahfouz, who is also on the board of the Eric Trump Foundation, the philanthropy started by one of Trump’s sons for children with terminal illness. A few years back, before he entered politics as a candidate, there was more truth to claims that Trump gear was not made in America. Former Late Show host David Letterman brought out a number of buttoned shirts and slick ties from the Trump brand clothing line for Macy’s (which dumped him after his fiery statements about Mexicans in July) in a 2011 interview. Letterman pointed out that his ties and shirts were made in China, according to the label. At the time, Trump was supporting Republican Mitt Romney for president and had been accusing China of taking American manufacturing jobs. Trump smirked as the crowd cheered before he defended himself, saying "it’s very hard to get product that’s not made in China" because of the country’s currency manipulation. Tweets aim to paint Trump as a hypocrite for hawking "Make America Great Again" hats with "Made in China" labels from his campaign store. Those hats are knockoffs. Trump has even trademarked the phrase "Make America Great Again." 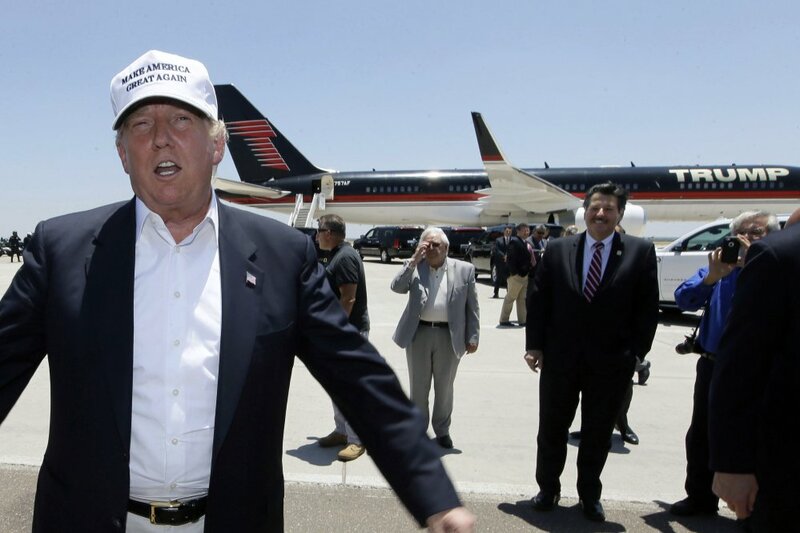 Trump’s hats are made by a California company that says they are, indeed, American made. Published: Wednesday, October 7th, 2015 at 6:40 p.m.